Pumps, sumps, skimmers, lights, fish room, under-tank set-up, etc. Looking nice. What livestock do you have in it? i love the finishing trim on the wall. Refugium lighting: 175 Ushio on a Ice cap ballast for 18 hrs. Mysis, nori flakes, bloodworms, cyclopeeze. Your tank looks great. It's very similar to what I plan on upgrading to shortly. 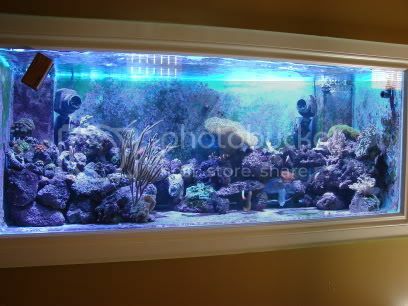 lets see that fish room. the tank finish looks very clean.!! !